Until recently, I wasn’t familiar with the term “macgyvering.” My sister first used it, and then I saw another reference on Facebook. MacGyver is a fictional TV character from the eighties, known for solving problems with low-tech solutions. He carried a pocket knife and a roll of duct tape, and preferred a peaceful solution whenever possible. Somewhere along the way, the term macgyvering joined the mainstream. It’s used to describe creative solutions by cobbling together common, every day items. I like it! For years everyone macgyvered. We referred to it as ‘making do.’ It remains common practice in developing countries around the world. My friend Nandini, back in India after a decade in the States, tells me that you never see things tossed on the ground, because someone else will have picked them up and put them to use. 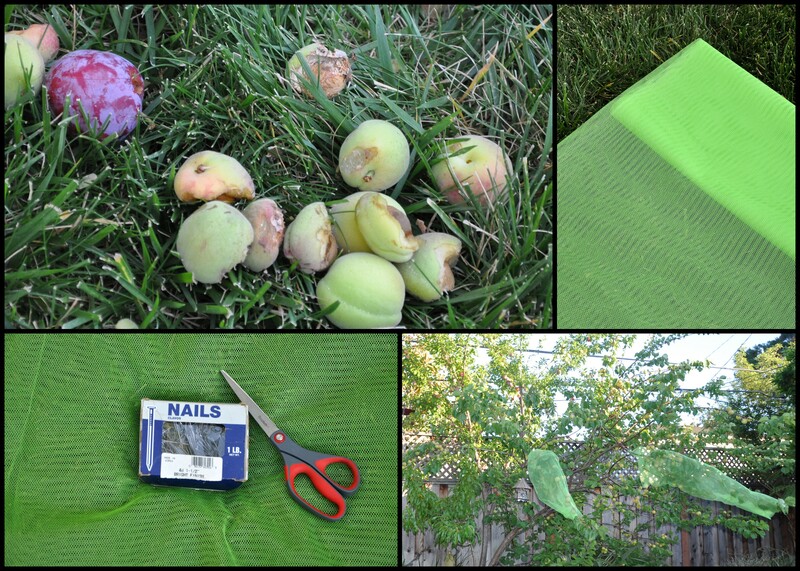 First up, fish nets for your fruit tree. 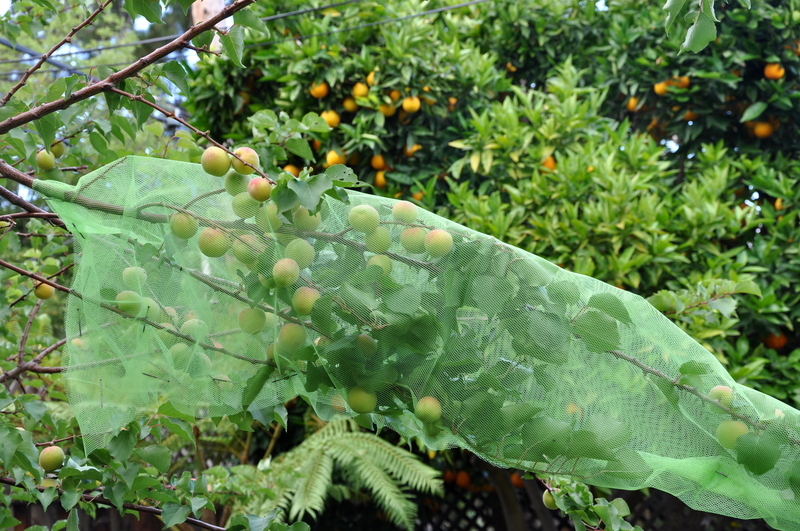 I borrowed this idea from my friend Laura’s dad Bruce, though to be fair, he did not use the term ‘fish nets.’ Bruce cut lengths of tulle found at a fabric store and secured them around the branches of low-lying fruit. Brilliant! He sent me home with a sample of the material, and I copied his design to the letter, cutting the tulle, then attaching it like a sleeve using nails. The birds, rats and squirrels are welcome to the fruit outside of the net, but we’re reserving a few branches for ourselves. My tomatoes self-seeded this year, including the one pictured below. Most of them grew in the planter box, but this cherry tomato is growing from the bottom of my rotating composter. I wasn’t sure how long it would last, but I continued to water it and there it grows. Last week it touched ground. What’s a gardener to do? 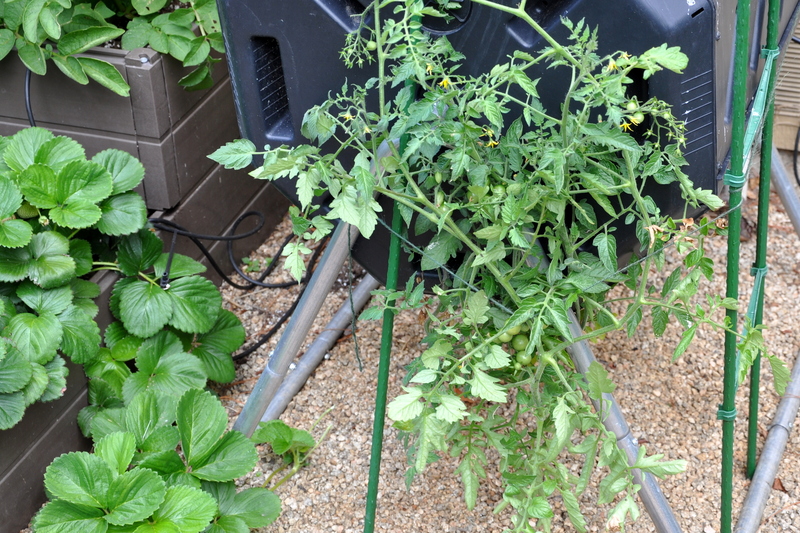 I used two stakes from a tomato staking kit, and a few strands of garden string and managed to stake the plant securely. I ran the string along the side to the back for extra support, then lifted the branches off the ground and through the supports. The rotating composter is out of business for a few months, but it’s all in the interest of delicious tomatoes. I cut a length of foam to size from my son’s ‘water noodle’, a two-dollar swim float. I cut up the sides, then wrapped it around the coiled cable. This helps support the weight of the cord, and at the same time keeps it from snapping back. To protect the switch box, I wrapped some pieces of insulating foam around the top and sides, leaving the switch exposed. The padding makes it more slip-proof, and at the same time acts as a shock absorber if it’s dropped. You knew I would eventually get around to duct tape, didn’t you? 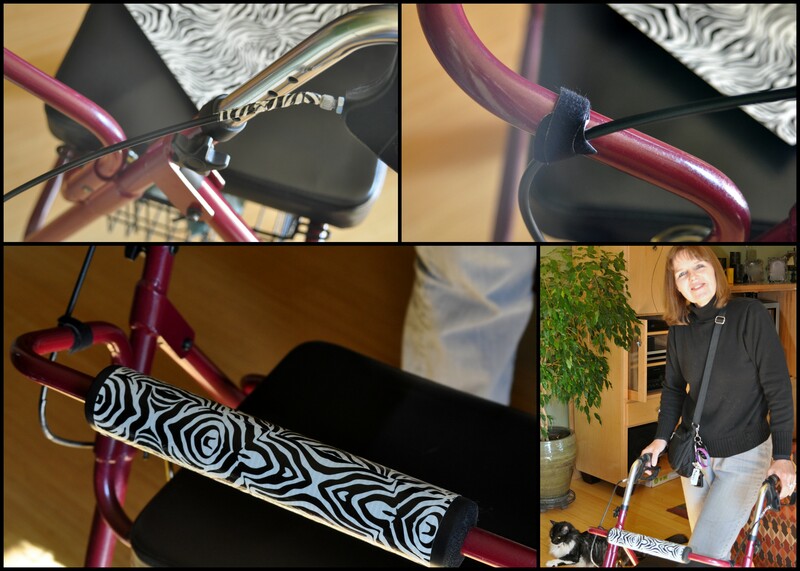 Sharon relies on her walker to travel short distances. She found that the coils, attached to the hand breaks, were fraying from the flexing of the cables. I used fashion-forward duct tape, available in her favorite animal prints. I cut the tape into small strips, then wrapped it around the cables at the base of the handles. The zebra stripe on the padded front is merely a fashion statement. To reduce the stress on the cables, I loosely secured them to the bars with a pair of cable Velcro straps. Do you macgyver? Please share your ideas in the comment section below. Photos welcome and encouraged. This entry was posted in Community and tagged duct tape, ha, home repair, macgyvering, mobility disabilities, repairing a scooter lift, staking tomatoes, using what you've got. Bookmark the permalink. Sorely disappointed I can only like this post once. I grew up watching Macgyver obsessively. You definitely have his knack! McGyver Queen!! My girls loved McGyver when they were just little wee bugs!! One has inherited his talents, just like you without even knowing you had! Brilliant solutions for your sisters issues and I am so looking forward to hearing about the taste of the tomatoes!! When you said ‘nails’ in the same sentence as ‘netting’ and ‘tree’ I was horrifiedly [is that a word?] waiting for ‘hammer’ as well,,,,,,,,,,, What a clever solution! I hope Ms Fran comes by from Serendipity Farm to catch up on this cleverness! If she doesn’t lets get her over! Hurray for McGyver! Hurray for your daughter McGyvering. Isn’t it funny what makes it into the lexicon? Sorry to make you cringe at the nail portion of the post. I can see now why you would. I’m so glad I took close up shots of the nails in the mesh to ease your mind. Thanks for your vote of confidence, P! I loved the show and the term. Much more fashionable than Jerry-rigged. BRILLIANT solutions! MacGyver would be proud. :). I can’t think of any that I’ve done, but then I have no brain this week. You’re poor brain is on house-buying overload. I sure hope it settles out soon. Thanks for the kudos! These projects are fun. Thank you. I’m so excited, I told you twice now! My children are even more excited for me. They know how far I’ve had to travel to get here. What a journey! Yeah! You’re definitely a member of the macgyvering club! LOL, you rock. That’s a great ‘Aqua’ noodle re-purpose. Sharon looks absolutely beaming and beautiful in this photo too. I used to really love that show and have used that term often. Probably more often at the lake than at the condo. I can’t think of anything presently to share as far as tricks or tips go but I’ll give it some thought. Those fruit socks are pretty unique. Are they working? Sharon does look adorable in these pics and happy and relieved too. They charge ridiculous amounts of money to fix and repair these things. It was nice to come up with a free solution to extend the life of the parts. The fruit socks are working! Isn’t that great? I’m so pleased. I’ll bet you did plenty of macgyvering at the lake and you just don’t remember because you were so busy just getting it done. I’m so excited to hear more and more about your new place. You’ll have that Clematis looking gorgeous along with everything else. We loved that show too. Yeah! What would McG do? I love that, Mary Elizabeth. Wonderful solutions that McGyver would be proud of! 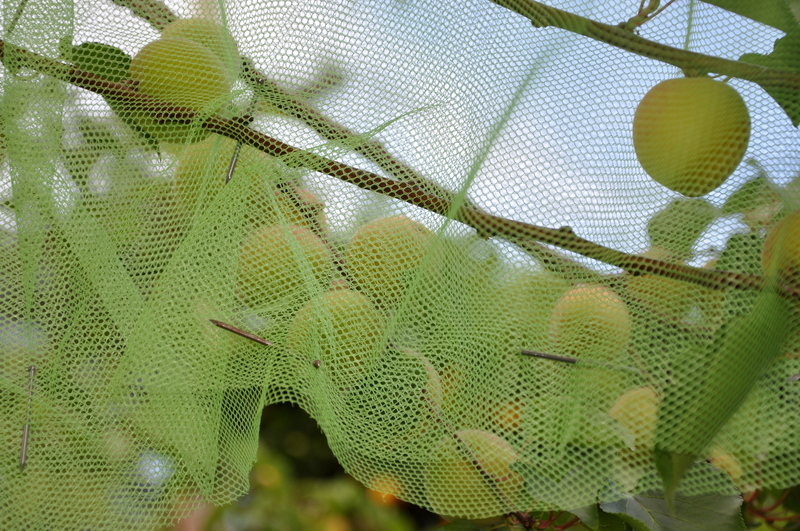 I have a friend who puts pieces of netting at random throughout her fruit trees, and she says this discourages birds and other critters from bothering the trees. Also, thanks for visiting my own blog and for your kind comment. Your blog is great! Truly awesome McGyvering Alys! I also loved how you left some fruit for the birds, but I hoard our veggies and will not share. I bet you could add a McGyver title on me too! Being creative is awesome, and so are you! You rock Alys! Val, you definitely get the McGyver sticker. You do it all the time. I should create a button that we can all put on our blogs: I McGyver or Proud to McGyver…something like that. Hee! Now that would be a fun idea for you to create! I guess I do McGyver a bit over here too! Did you ever watch the show McGyver? I love reusing things. It makes good sense in so many ways. Thanks, Cathy. 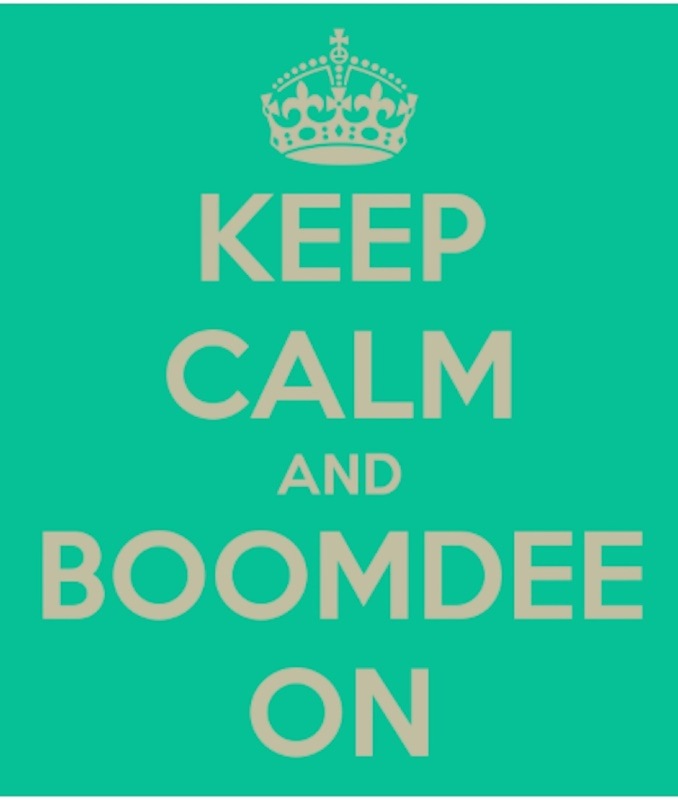 What a great show that was and MacGyver would be proud! Thank you, LB. It’s nice to have her living so close (just a mile away) now. She lived in San Diego for several years, and then Iowa. Now we see each other a few times a week. Your fix for my scooter lift has been truely amazing! It hasn’t hit the ground once since you rigged this. I had the lift for 6 years before replacing the hand held pendent, then in only one year it had to be replaced again. Sharon, I’m happy to hear that it worked out well. It really was a quick, inexpensive fix and it makes for a fun story, too. These Toyota vans sure hang in there. Ours is at 135,000 and still going strong.